Today’s episode features Marcus Sheridan, also known as The Sales Lion. Marcus is a marketing and sales guru. He’s best known for his concept “They Ask, You Answer.” He has definitely given us a kick in the pants when it comes to making helpful video content and making an “answers” page for our customers. As a professional speaker, he’s also delving into area like: individual strengths, personal success, and true fulfillment. He’s such a likable guy, and you’ll love him on his show The Balance if you dig the ideas they explore on fulfillment. 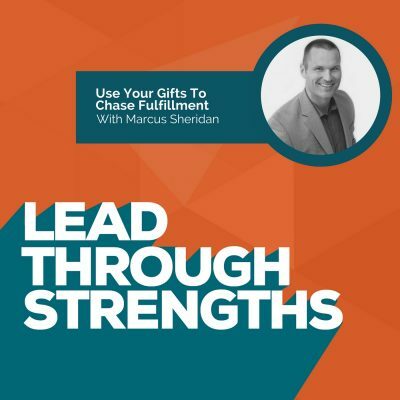 If you’re curious about how he’s become so good at interacting with clients and prospects, listen in. This episode is especially perfect for marketing and sales people. Lisa and Marcus also get a kick out of their mutual love of the word “dang.” Yes, it’s a southern thang. Lisa is from Austin, Texas and Marcus is from Heathsville, Virginia, so they had a laugh about their vernacular. And don’t worry, neither one will drop a “bless your heart” phrase on you when they’re actually trying to tell you that your marketing or strengths based leadership efforts are terrible. How to tap into your personal strengths. Marcus tells us that he has done this from a young age. He’s accomplished this by being self-aware at all times, and by tuning into his audience’s reactions (whether it be one person or a whole audience). Signs to look for: Is the person leaning forward because he is interested, or back because he’s bored? Is he looking up because he’s having a reflective moment (which should be your goal), or is he looking down because he’s only listening and not thinking? If he is smiling at you, this is good, but if he’s looking at you blankly, he may just be trying to stay awake! The art of the question. Our job as communicators is to help our audience discover an insight, before we even say it. This can only occur if we ask the right questions. Listen for Marcus’ mention of the mirror of life, and see how people are really reacting to you. If you present things in the correct way, your audience will feel like “it” (whatever that is), is their idea. They won’t conclude that you forced them into compliance with your idea. Besides Marcus being a great listener in a human-to-human way, he’s also excellent at tuning into customers. You’ll see his living proof of “they ask you answer” in the way he adds value on his website and how he shows up in helpful video content. Prioritization. It’s important to prioritize everything in your life, based on what brings you the most energy. Using your strengths will often bring you energy. To find out what your strengths are, grab the book StrengthsFinder 2.0 and use your code in the back of the book. Peak states in life when you’re (in the flow) are times when you are gaining energy, not spending it. Learn to love what you are, and know what you aren’t. For example, Marcus put his family first and his business second. the helps him to know exactly what he should say NO to. You may have to walk away from opportunities, even when they are attractive, if they don’t fit in with your priorities. There was a time when Marcus failed to say no to a great opportunity in San Francisco, California. It turned out to be four days of speaking all day, seeing no Silicon Valley sights, and missing his family. And, people were eating while he was speaking, instead of listening. This was an “ah ha” moment, when he decided to never let money or ambition supercede his priorities – family and self-care. In order to feel true fulfillment, you must move toward something rather than running away from it. Explore your career. It’s very much like a hiking trail. You can’t tell where it’s going to go; you need to keep walking to see. If an idea seems seeded in you, explore it. See what it grows into, and play with it. Get in the sandbox. For example, even Marcus has given himself a 3-5 year on-ramp to play in a career transition. Keep an eye on Marcus. He’s living proof of how this works as he authentically shares his exploration into the topic of life, family, and fulfillment – and how they intersect. You can reach Marcus through his website or Twitter. To listen to his amazing podcasts, click here. Lisa particularly loves The Mad Marketing show. He also does the Hubcast Podcast, One Last Tool on sales and marketing tools. And The Balance show we mentioned earlier. How does he keep up with all of this? The man is an animal (a very kind one). Marcus’ book is They Ask You Answer: A Revolutionary Approach to Inbound Sales, Content Marketing, and Today’s Digital Consumer. A selection of Jim Rohn’s books – Leading an Inspired Life, My Philosophy For Successful Living, The Art of Exceptional Living (a cd). Jim Rohn was a huge inspiration to both Marcus and Lisa when they were first digging into personal development. In fact, Lisa used to drive around listening to Jim Rohn and Zig Ziglar tapes (yeah, cassette tapes back in the day).